NASA astronaut Jack Fischer checks the fit of his spacesuit before his first spacewalk on May 12, which will be the 200th spacewalk made in support of the International Space Station. He and NASA astronaut Peggy Whitson, current commander of the station, will venture out to replace an avionics box. Two NASA astronauts will embark on the International Space Station's milestone 200th spacewalk this morning (May 12), when they will spend 6.5 hours upgrading and maintaining tools and experiments outside the orbiting lab. This will be the ninth spacewalk for space station Cmdr. Peggy Whitson — who set a spacewalking record for women on her spacewalk in March — and the first for flight engineer Jack Fischer. The duo is set to exit the airlock around 8 a.m. EDT (1200 GMT), and NASA coverage will begin at 6:30 a.m. EDT (1030 GMT), although the spacewalk's start time can vary based on the astronauts' preparations. You can watch the spacewalk live here on Space.com, courtesy of NASA TV. The spacewalkers' primary task is to replace a failed avionics box that provides data transfer and electricity to the science instruments secured outside the space station, NASA officials said in a statement. Whitson and Fischer will install a spare of the large component that launched to the space station last month. After they complete that replacement, the two astronauts will install a shield on a pressurized mating adaptor, PMA-3, which will attach to an International Docking Adaptor to allow future commercial spacecraft to dock with the space station. Whitson and NASA astronaut Shane Kimbrough finalized PMA-3's installation on the last spacewalk, although one shield was lost to space. The two will also install a connector for the Alpha Magnetic Spectrometer, an instrument that searches for signs of dark matter, to test one of its data circuits and prepare for future work on the device. In addition, they will install a high-definition camera and a pair of wireless antennas. 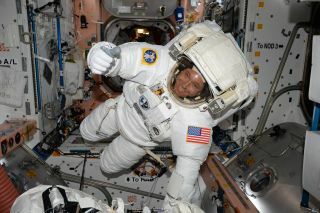 Whitson can be identified by the red stripes on her spacesuit, and Fischer will wear a suit with no stripes. French astronaut Thomas Pesquet will assist the duo from inside the space station. The first spacewalk for space station assembly and maintenance happened in December 1998, when two NASA astronauts operating out of the space shuttle Endeavor attached the first two components of the station: the Russian Zarya module, which had already launched, and the U.S. Unity module.